I was pleased to present these slides at this international pre-BETT event organised by BESA and Steljes – it gave me a chance to glue together the thinking we have developed over the year in Core UK through our projects. Linking the National Archive of Educational Computing (hindsight) to our work to facilitate communities of curriculum innovation with QCA (insight) and to the meeting in Kronberg to consider the future of Knowledge Sharing and Acquisition which we helped to organise with UNESCO (foresight) gave me great pleasure – as did the first outing for my analysis of delight, in part based on John Heron’s work. Interesting presentation! Hope to see you at TeachMeet08 tomorrow. 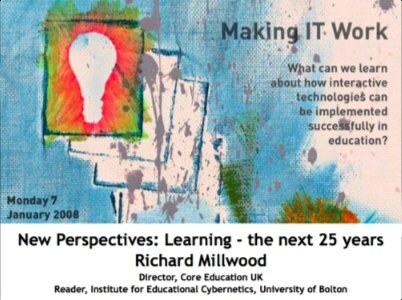 … is for Richard Millwood's thoughts and reflections on learning, technology and its development. For more on all of this, read my Phd 'The design of learner-centred technology-enhanced education' and my earlier blog - Ricardo's Blagado. Computational Thinking and Art | Richard Millwood on How does technology enhance learning? Sam Aldred on How does technology enhance learning? Audrey Clark on How does technology enhance learning? Richard Millwood – “Could Brentwood schools be more like Cambridge University?” | educatingbrentwood on Could Brentwood schools be more like Cambridge University? Profound Implications of the Still Face : John Connell: The Blog on Is society presenting a ‘still face’? Keynote broadcast on Can we improve the future with lessons from our past? Paul Richardson on Can we improve the future with lessons from our past? richard on Channel 4 Education Debate – Staying On? Stephen Powell on Channel 4 Education Debate – Staying On?